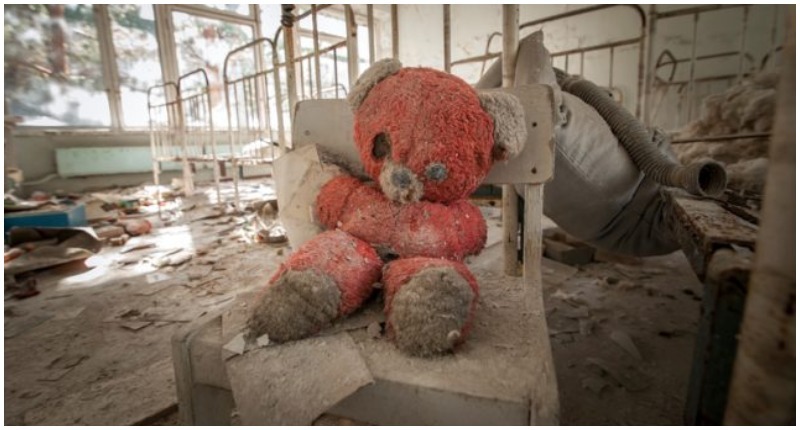 Old red teddy bear sitting on a chair in an abandoned kindergarten in Pripyat - Chernobyl nuclear power plant zone of alienation. The 1986 explosion at the Chernobyl nuclear plant in the former Soviet Union was a Europe-wide nuclear catastrophe. For ten days straight, the damaged reactor vented nuclear materials into the atmosphere, sending bitter clouds across the continent to spew forth acid rain. Two plant workers were killed by the initial explosion, and 134 emergency workers (known as ‘liquidators’) sent to the site were hospitalized with radiation sickness. 28 of them died in the coming weeks and months, and another 14 later died from cancer caused by the high doses of radiation. 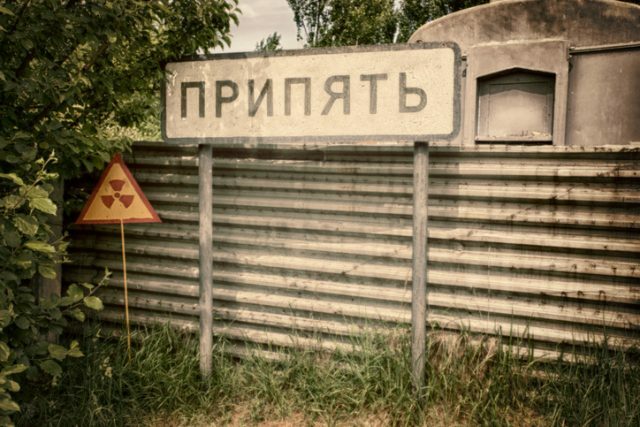 The nearby town of Pripyat was evacuated, but the damage was done – over 15 children would later die of thyroid cancer. 116,000 people were bussed out of the surrounding area at first, then another 234,000 as fears of contamination increased. Farms in the region reported a surge in animal mutations, as newborns were born gruesomely deformed, some missing limbs, eyes, and even heads. 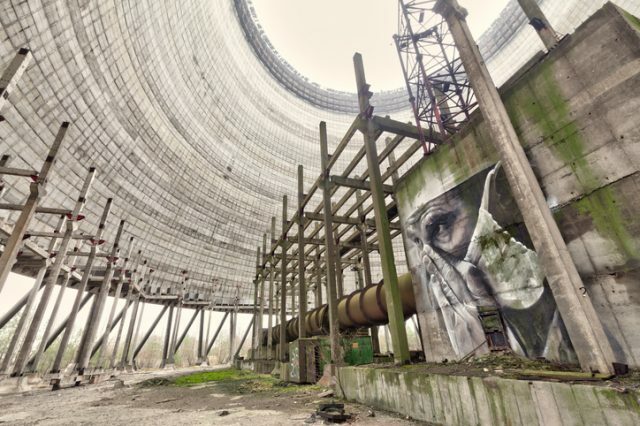 To contain the radiation a concrete dome was built to enclose the site of the doomed reactor and a 2,600 km2 exclusion zone surrounds Chernobyl. Officially called ‘the Zone of Alienation’ and overlapping the borders of Belarus and Ukraine, Chernobyl is now an eerie landscape of skeletal apartment blocks and ghost villages reclaimed by the green talons of nature. Despite its foreboding reputation, according to BBC News people have started to move back to the edges of the exclusion zone. An estimated 130 and 150 people have braved radiation – and Ukrainian law – to make a life in this surreal climate. Most of them are elderly women who returned to their small family farms knowing no other life, but affordable land has attracted families fleeing conflict zones. 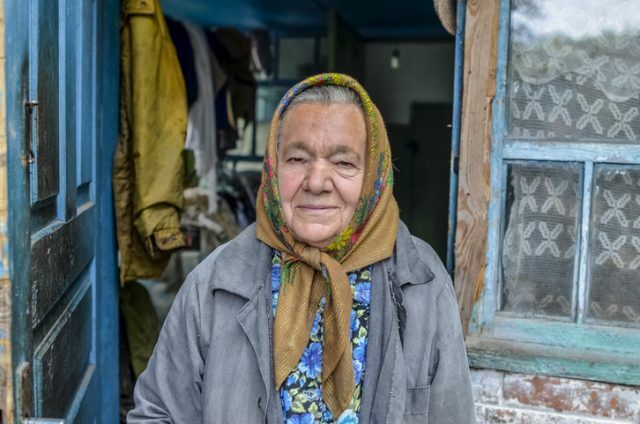 Chernobyl, Ukraine – August 27, 2012: A Ukrainian women who live in Chernobyl’s post-nuclear disaster “Zone of Alienation” or “Dead Zone” for more than 25 years. She lives with here husband 6km from the Reactor, in the less contaminated east side of the Chernobyl reactor. they live of self grown crop and vegetables. Those living in the exclusion zone have access to gas, electricity and a phone signal, but there’s no sewage or running water. Groundwater is contaminated and anything from a well must be boiled before use. With no real industry the only income is welfare, but homes can be bought for hundreds of US dollars from owners who left in 1986 and never returned, and there’s plenty of land to grow vegetables and for livestock to graze. Chernobyl, Ukraine – August 27, 2012: A Ukrainian man who live in Chernobyl’s post-nuclear disaster “Zone of Alienation” or “Dead Zone” for more than 25 years. 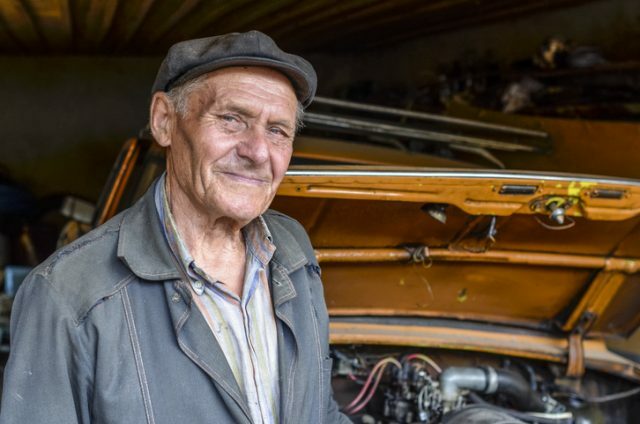 He lives with his wife 6km from the Reactor, in the less contaminated east side of the Chernobyl reactor. they live of self grown crop and vegetables. The community also bands together to provide solutions to those in need. The BBC spent time with a woman called Maryna who arrived from Donbass with her children. Unable to afford a home, she was asked to care for an elderly resident with dementia – when he died two years later, the family inherited his home. In this way, the influx of newcomers is providing a vital lifeline to the aging ‘refuseniks’ who returned decades earlier. Chernobyl Nuclear Power Plant Zone of Alienation is exclusion zone around the site of the Chernobyl nuclear reactor established by USSR soon after disaster 1986. 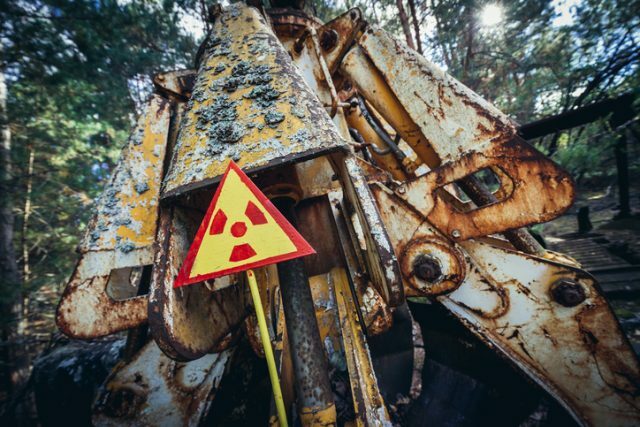 Despite atmospheric radiation having fallen to safe levels for much of the Chernobyl exclusion zone, the soil is still contaminated and the risks aren’t fully understood. Dr Valery Kasparov, from the Ukrainian Institute of Agricultural Radiology (UIAR), told the BBC that potentially dangerous levels of radioactive Caesium-137 have been found in cow’s milk which could lead to thyroid cancer. 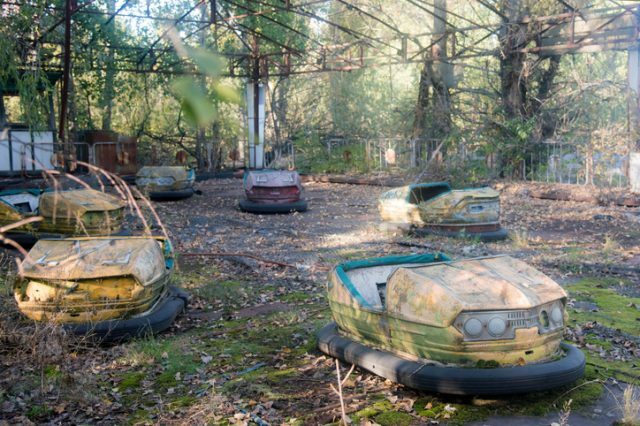 The amusement park of Pripyat , It was to be opened for the first time on May 1, 1986, in time for the May Day celebrations but these plans were scuttled on April 26, when the Chernobyl disaster occurred a few kilometers away. The radiation in the soil entered the roots of the grass, which was then consumed by cattle. Further risk may come from wild produce, like mushrooms or berries which haven’t been studied yet. Dr. Kasparov added that the danger mainly comes from radioactive ‘hot spots’ in the exclusion zone and his team are in the process of mapping them to help keep families like Maryna’s safe. “Radiation may kill us slowly, but it doesn’t shoot or bomb us,” Maryna said. “It’s better to live with radiation than with war”.